e-Fuel vs Skratch Hydration Sports Drink Comparison. Maltodextrin or Simple Sugar? The comparison between Skratch and e-Fuel is dramatic. Skratch is 95% simple sugars and virtually no complex carbohydrates. e-Fuel provides twice the energy, more electrolytes and anti-oxidants, and it cost about 40% less! 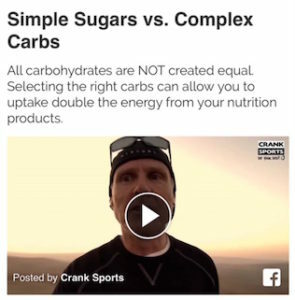 Watch this short video (right) to see why the complex carbohydrates in e-Fuel can provide you with significantly more energy than the sugars in Skratch. The beauty of a good sports drink is that it is rapidly absorbed in your small intestine by osmosis with no digestive requirements. Another way of looking at this is that the water in your sports drink becomes the transport vehicle for the other good stuff in your drink (energy and electrolytes). However, in order to be absorbed, the fluid in your intestine has to be an equal or lower concentration than your body fluids. The measure of fluid concentration is called osmolality. The osmolality of Skratch is approximately equal to your body fluids (isotonic), thus allowing it to be rapidly absorbed – that’s a good thing. The beauty of complex carbohydrates is that because of their larger molecular structure you can get much, much more energy in an isotonic solution compared to a drink made with simple sugars. Case in point, e-Fuel is also isotonic but it contains twice as much energy as Skratch – that’s an even better thing!! Both drinks will be rapidly absorbed, both will keep you hydrated, both will replenish your electrolytes … but e-Fuel will provide twice the energy. Bottom line, if you’re an endurance athlete there isn’t enough energy in Skratch to keep you going, you need to get more energy from somewhere. Once you start eating and drinking it all ends up in your stomach …. the Skratch, the banana, the PowerBar and what ever else you decide to eat. Guess what, the osmolality of the fluid in your stomach just went up and the absorption rate slowed or even came to a halt. Not a good thing. Most foods that you eat contain proteins, fats and/or fibers. Once one or more of these are introduced to your stomach they have to go through a digestive process. When you are doing aerobic activity the blood supply to your stomach gets shut down in order to maximize blood flow (and oxygen) to the working muscles for the oxidation process. More oxygen = increased performance (just ask Lance). Digestion of those foods you just ate requires blood flow back to the stomach and away from the working muscles … and that sound you just heard was your performance dropping. We all know that bananas are one of the most common foods consumed by endurance athletes, but do you know how long it takes a banana to leave your stomach? Try 3 hours and 15 minutes! Eating solid foods as Skratch recommends during typical workouts or competitions might taste good and satisfy your craving for food, but it does little if anything for your performance. If your an ultra athlete competing for 20+ hours the normal rules don’t apply to you. You are going at a slower pace so you can afford some blood to go back to the stomach to work on digestion. And if it takes 4+ hours for the banana to kick in that’s okay! Electrolytes are critical to maintain hydration and to avoid cramping and injuries. Both e-Fuel and Skratch do an excellent job of providing electrolytes. Antioxidant vitamins C and E help protect against tissue damage, reduce soreness and aid in the recovery process. There’s virtually no antioxidants in Skratch.